The records of the Westchester County Department of Social Services provide a short course in the history of public welfare and how approaches and attitudes towards it have changed over the last century and a half. From the inmate records for the County's almshouse to the reports filed by predecessor departments and divisions, these records provide useful descriptive and statistical information for understanding the changing nature of social welfare, child welfare, and treatment of the poor, sick and insane. 7 reels; 25 volumes. Various arrangement schemas within volumes. The Westchester County Almshouse was established in 1828 by the Board of Supervisors, at the direction of the State of New York. Prior to this time, responsibility for the care of indigents, the insane, orphans and abandoned children was held by the individual towns of the county. The records document inmates' admissions and discharges both by inmate number, and by placement from the various towns within the county. Various financial and property records reflect the care and destiny of the Almshouse residents once they came under the county’s care. Finally, some of the records specifically address the care of children at the Almshouse, and the connection between the Almshouse and other charitable institutions established for the care of children. Some of the most detailed information about Almshouse inmates is found in the inmate records organized by inmate number (1875-1908). Many of these, particularly the earliest ones, provide information on the inmate's nativity, health, personal habits, as well as an unflinching assessment of his/her chances for returning to life beyond the Almshouse. An index for these records in being created and will be available on this website in the near future. Reports of repairs and improvements to the various buildings used by the Department of Welfare. Includes figures for machinery output, cost and repair; coal, electric and gas consumption; laundry statistics; and reports of commodities produced by the County Farm. Less than 1 cubic ft. Arranged chronologically within divisions. View box and folder list. Reports of the Inspector of the County Home (1914-1930, gaps) and Annual Reports of the County Home (1925-1961). Inspector's reports describe buildings, grounds and equipment and report on the quality of hygiene, food and clothing provided for the residents. Statistics give their ethnicity, race, age and physical condition, as well as personnel and salary figures. Social and recreational amenities are described. Of particular interest is the 1928 report which describes in detail the process by which the County Home became a part of the Grasslands complex. Annual Reports begin with simple statistics and a ten-year census report. Later years detail ethnic nativity, religion, civil status, education, age and physical conditions of residents of the Home. The 1929 report includes a 1916-1930 historical summary of the Home. A 300-page study of organization and administration of the County Home, completed in 1959, is part of these records. Related records: Series 172, Department of Social Services: Director of Public Welfare Reports, 1915-1972 (Note: Some earlier (1915-1924) reports of the Division of the County Home may be found in this series); Series 177, Department of Social Services: Historical and Memorial Records, 1830-1974 (bulk 1913-1937, 1955-1974). 2 cubic ft. Arranged chronologically. Reports which document the expansion and growth of the Division as it became nationally recognized in the field of public health. The reports begin as narratives, gradually become more detailed and eventually add a separate statistical report, becoming 300-400 pages combined. Tables showing patient numbers, occupation, nativity, ethnicity, civil status, and religion are present. There are comparisons of days of care, lengths of stay and per diem costs, as well as profit and loss statements for some years. Medical and psychiatric diagnoses are extensive. Meal and special diet records are considerable as are tables of in-house manufacture and use (clothing, alcohol, pharmaceuticals, narcotics) and many other items of expense. Low salary levels of employees and nurses were a continuing concern of the Director, as was keeping up with current medical and nursing standards of care. Grasslands was in the forefront of diagnosis by x-ray, use of radium for cancer treatment, and palmprint identification for newborns. Schooling was offered for both tubercular children and adults. Memoranda which passed between the Commissioner and First and Second Deputy Commissioners, commenting on the annual report, are present, as well as comments by the Director. Most years have copies marked with paragraphs to be deleted or wording to be changed, and for some years the printed copy--as seen by the general public--is available for comparison. Related records: Series 172, Department of Social Services: Director of Public Welfare Reports, 1915-1972 (Note: Some earlier (1917-1927) reports of the Division of Hospitals may be found in this series. In particular, reports in this series document the first psychiatric services in 1922 and establishment of a School of Nursing in 1927). 3 cubic ft. Arranged chronologically. View box and folder list. Drafts of Annual Reports to the Board of Supervisors (1915-1972); Reports to the New York State Department of Social Welfare (1951-1961); and Financial Reports of the Department (1950-1961). These reports include personnel lists, employee salaries, medical reports, and many studies of tuberculosis, infantile paralysis, venereal disease and alcoholism. Included also are statistics about residents of the County Home, children served by the Department, and inmates in the Penitentiary (including reports of an experiment in prison self-government beginning 1918). Related records: Series 173, Family and Child Welfare Division Reports, 1922-1961; Series 174, Director of Hospitals Annual Reports, 1928-1947; Series 175, County Home Reports, 1914-1916, 1920-1921, 1923-1961; Series 176, Buildings and Power Plants Division Reports, 1943-1951; Series 178, Social Welfare Department Monthly Report Bulletins, 1961-1967. 2 cubic ft. Arranged chronologically within departments. Reports of the Inspector of Child Welfare (1922-1937, gaps) are narrative and statistical reports which document numbers of children receiving aid through mothers' allowances, in foster homes, and in institutions. Home inspections detail the character and personality of the children and their care-givers and provide candid evaluations of home-life. (Note: Certain restrictions apply to these records). 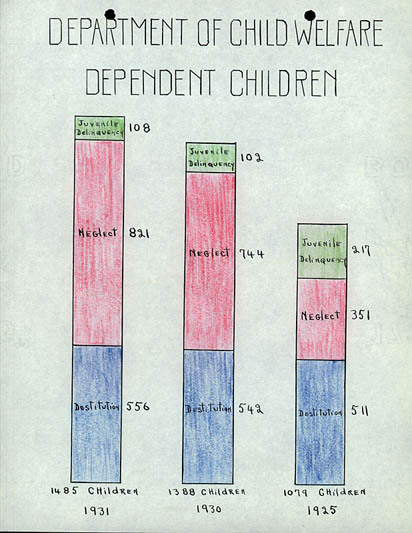 Annual Reports of the Division of Family and Child Welfare (1925-1961) trace the Division's growth and development; its response during and after the Depression to newly-passed Federal legislation; and its assumption, after the Public Welfare Law of 1930 and decentralization of 1940, of what had been town and village responsibilities. Related records: Series 165, Pforzheimer Papers: Joint Committee on Public Assistance Records, 1947-1952; Series 172, Director of Public Welfare Reports, 1915-1972. Less than 1 cubic ft. Arranged chronologically. View box and folder list. Materials about the organization, policies and history of the department, and about social services developments in New York State. Includes chronologies, speeches, articles, clippings, and memorials to members of the department. Of particular interest are photocopies of the 1830, 1831 and 1836 Almshouse Reports, and a copy of an 1856 State Senate Inspection of "New York Poor Houses, Lunatic Asylums and Orphan Asylums." Related records: Series 175, Department of Social Services: County Home Reports, 1914-1916, 1920-1921, 1923-1961. Published monthly reports of the department, written for general public distribution. These describe programs and services and offer rationales for policy. Subjects are topical for their times, including such issues as aging, literacy, aid to dependent children, the "War on Poverty", and Cuban refugees.